However, I have discovered that thankfulness is a very fickle thing. Often, our thankfulness focuses on things that are physical in nature. We are thankful for our health. 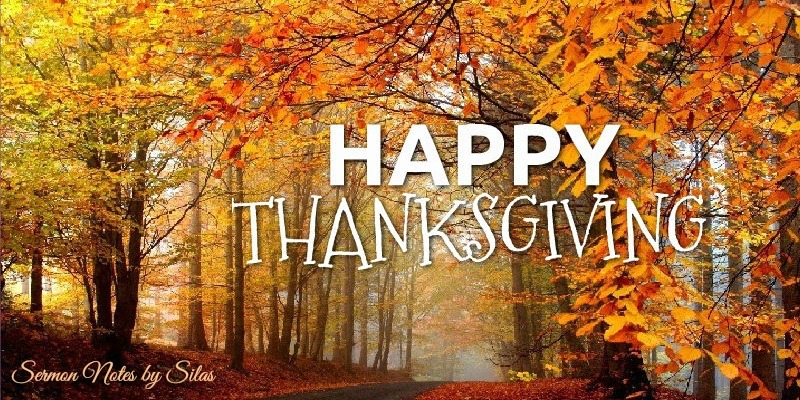 We are thankful for our families and our homes. We are thankful for our financial stability. We are thankful for the things we have. Yet, all of these things are subject to change. Think about it, health can break, families can split up and bank accounts can run dry. What do we do then? How does that affect our thankfulness? I would like to suggest that we remain thankful for all the physical blessings we enjoy, and that we learn to look beyond those changing things to some things that never change. I would like to share a few of those unchanging blessings with you this evening. Notice in the verses before us today, some Unchanging Reasons For Thanksgiving. These verses tells us of just a few of the unchanging glories of our Lord! The things revealed here are causes for thankfulness at all times. His Abiding Presence (v. 5-6, 8) - Regardless of where the path of life leads, the saint of God will never walk alone - Matt. 28:20; Isa. 41:10! His Assisting Presence (v. 6) - The word "helper" comes from a word which means to "to run". The idea is that when we are in need, the Lord runs to our aid. He is our Comforter - John 14:16. His Anchoring Presence (v. 8) - One of our greatest sources of thanksgiving this evening is in the truth that Jesus never changes! What He was then is what He is now! From before creation on into eternity, Jesus has never, nor will He ever change! He is still "I AM!" He still possesses all power in heaven and earth, Matt. 28:18. We can always be thankful for our Savior! The Pain Of It (v. 12) - For us the price was low, for God, the price was unimaginable! Our salvation cost God the life of His Son, John 3:16. His death on the cross is what provided salvation for you and me! There is no way that we can adequately describe the gory details of the death of the Lord Jesus, But the prophet Isaiah tells us something about what He suffered for us, Isa. 53:4-7. We can be thankful, everyday, that even though He knew what we were and what we would be like after He saved that He still went to the cross and died for our sins! The Purpose Of It (v. 12) - We are told here that He suffered the death He did so that He might "sanctify the people." The word "sanctify" means "to separate from vain things and set apart for God's use." This is why Jesus died! He died to take vile sinners out of their sins and set them apart from this world for the glory of God. He saved us so that we might become different and that God might be able to use us for His glory, 2 Cor. 5:17; Ill. Paul 1 Tim. 1:12-15. We can be thankful that we which were so lost and wicked have now been cleansed and set apart for God's glory through the blood of Jesus! The call of this verse is for us to do on the outside what He has already done on the inside. That is, He has set us apart inwardly through the redemption of the blood of Jesus. He call to us is that we willingly take our stand with Jesus on the outside of society. He is calling us to pick up our cross and bear the reproach of Jesus, Matt. 16:24. He is telling us to be different - 2 Cor. 6:17. We ought to thank the Lord that He has made a change in us. The very fact that we don't live like we used to, that we don't find enjoyment in all the things the world is running to, that we are different is a cause for rejoicing everyday of our lives! We ought to stand out and we should be thankful when we do! Again, we are reminded that we are living in a world that is constantly changing. If all of our hopes are placed in this world and in the physical realm, then we are going to be disappointed more than we will be happy. However, the child of God can rejoice in the fact that this world is not the end all, tell all of our Christian experience! Verse 14 tells us that there is something better just down the road! We can thank the Lord this evening that when this journey is over, we have a city awaiting us were we can rest from our labors and where we can enjoy the sweet presence of the Lord. It is a place of which we know little, but we do know that none of the problems of life will be allowed there, Rev. 21:4. We do know that we will be with Jesus, John 14:1-3. We do know enough to allow us to be thankful for that blessed home that waits for every child of God. This evening we need to take a close look at the real blessings of the Lord! Let us be thankful for all the things He gives us. Let us praise Him for our health, our families, our financial blessings and so on. Let us not take them for granted. But, let us learn to be more thankful for those things which we can never lose! Let's learn to be ever thankful for those things that cannot change! When all the physical blessings have faded and we can find no reason for praise in them, let us thank the Lord that there are some things that will never change! In these things we have an unchanging reason for eternal thanksgiving! Why not come before Him right now and just thank Him for Who He is and for what He has given you and me!